There are plenty of good Spring Training updates out there along with projections for player and team performance headed into 2011. For something different, I figure it’s interesting to revisit stories of seasons past when, as seems to happen nearly every year, “Hope Springs Eternal” for players and teams. Thirty-six-year-old Sammy Sosa arrived in Baltimore in 2005 looking for a fresh start after a tumultuous end to his 13 seasons at Wrigley Field. 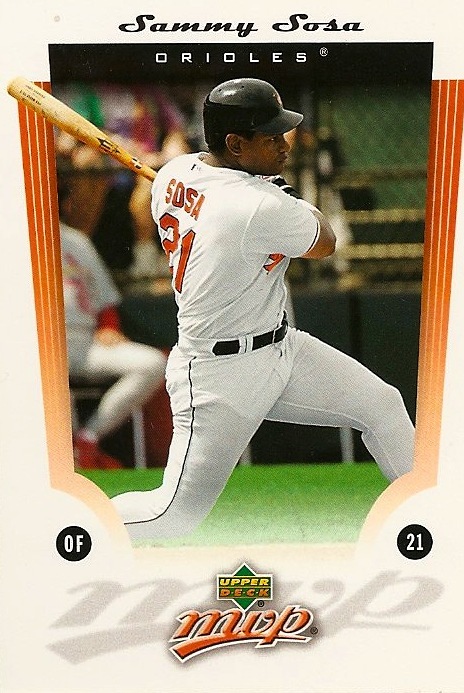 As the Orioles incorporate fresh faces into the 2011 lineup, including a couple of aging sluggers at or around Sosa’s age at the time, here’s a look back on what was being said about Sosa at the time. If anything, this story reveals how difficult it is to get an accurate read on those things we’re most likely to read about prior to the season — intangibles like a player’s attitude and drive. The following excerpts are taken from a June 13, 2005, Sports Illustrated article by Tom Verducci. First, a word from then-Cubs President Andy MacPhail on Sosa following his departure from Chicago. Next, a Spring Training anecdote that suggests Sosa had lightened up and perhaps changed his early season ways. On his first morning in an Orioles uniform, an on-time Sosa, the guy who made a habit with the Cubs of showing up–he thought–fashionably late for spring training, busted out of the batter’s box and sprinted full-bore for second base, the first in line for what he thought was a team baserunning drill. When he looked back, however, he saw his new teammates standing idly or walking back to the dugout. He’d been set up. But he laughed and lit up one of those smiles that for many people will always take them back to the sweet summer of ’98 and the great Home Run Race. And finally, some words on how Sosa’s fall from baseball grace perhaps introduced some humility to his persona. What is remarkable about Sosa this season, though, is what he is not. In Baltimore he is not the captain, he is not the best player in the room, he is not the diva with club officials and personal valets at his side, he is not the clubhouse deejay oblivious to the annoyance of his infamous boom box, he is not–by a long shot, given the boos he hears wherever he plays on the road–the most popular player in baseball. Sosa can’t sell Orville Redenbacher’s popcorn like he used to. As a counterpoint, consider this recent piece by The Sun‘s Kevin Van Valkenburg that looks back on Sosa’s brief Baltimore tenure. Sosa wanted out of Chicago so he could have a fresh start, because the fans had soured on him for a dozen different reasons, and he said all the right things in news conferences about how much he loved the people of Baltimore and couldn’t wait to be the old, beisbol-loving Sammy Sosa again. Approximately 99 percent of sports writers don’t search for scandal, they’re just interested in telling the truth, not some rosy version of it. And at that point, the truth was that Sammy Sosa was an aging, selfish, injury-prone slugger. Except I didn’t even really view him that way at the time. I just wanted to write an Orioles notebook about his foot injury because I thought the fans might want to know when his awful bat might return to the lineup. There are plenty of Orioles, like Brian Roberts and Adam Jones and Jeremy Guthrie, just to name a few, who I think are good people who understand the media is the best way for them to communicate how they go about their profession to the fans, in good times and bad. And there are plenty of Ravens I’d throw on that list as well, like Trevor Pryce and Kelly Gregg and Haloti Ngata, among others. But mull that the next time you see a clip of a professional athlete treating someone like dirt. Sammy Sosa isn’t a jerk because he most likely took steroids, and then failed to tell the truth about it. And he isn’t a jerk because he feuded with the media, both in Chicago and Baltimore. He’s a jerk because in the second half of his career, he treated people poorly, media and teammates included. When it comes to knowing a player’s attitude and demeanor, the truth is out there, but so is plenty of well-spun fiction. The latter is readily available now; the former often emerges over time. This entry was posted in Hope Springs Eternal. Bookmark the permalink.